Well, we didn't see this one coming—not even after iconic Sega designer Yu Suzuki tweeted a picture of a forklift on the eve of this year's E3. In the middle of Sony's PlayStation 4 press conference today, VP Adam Boyes announced that Suzuki is launching a Kickstarter for Shenmue 3. Fourteen years after the release of Shenmue 2, Suzuki wants to make a sequel, and he wants $2 million to do it. 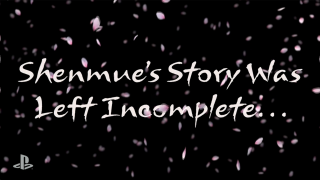 Here's what we know so far: Shenmue 3 will continue the story of the first two games. It's not a remake or a spin-off. The game will run on Unreal Engine 4. Several game developers who worked on the first Shenmue games are returning, including writer Masahiro Yoshimoto, composer Ryuji Iuchi, environment artist Manabu Takimoto and Ryo's voice actor Masaya Matsukaze. The Kickstarter's $29 tier gets you a copy of Shenmue 3 for PC and PS4, and a $60 tier gets you a special PC-only physical edition. Current stretch goals reach up to the $4 million mark, with several of those goals being for translations into German, French, and other languages. $3.2 million, $3.5 million and $4 million all add new features: a Rapport System, Skill Tree System and Expanded Baisha Village (perhaps the main hub area of Shenmue 3? ), plus 5 new mini games. As of this writing, the Kickstarter has 31 days to go.